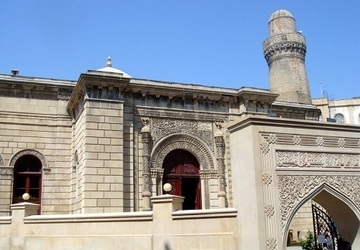 In 2010, the restoration work carried out by local specialists with the application of modern technology were completed at another monument of country value, the School-Mosque. Cracks in the dome have been plastered, the roofing has been reinforced, repair and restoration works in the interior have been fulfilled, the historical shape of the façade has been restored. A shop trading in carpets and rugs and pieces of Azerbaijan applied and decorative arts is accommodated there.